For the Portland-area phone lovers at PhoneLove we printed two-sided business cards on 600g Fluorescent White paper. Most featured purple on both sides, while select folks got a subtle tinted-white logo for a blind-deboss look. We rounded out the set with some folded notes. Posted in business cards and tagged with 600g, fluorescent white, purple, custom ink, logo, thank you notes, folded note, 300g, white, blind deboss, tinted white. April 25, 2017 by Travis Friedrich. These cards, printed for Los Angeles cycling studio BESPOKE, are printed on thick 600g Fluorescent White paper with tinted white on the front and two inks on the back. We finished them with a bright orange-red to match the ink. Posted in business cards and tagged with blind deboss, tinted white, edge painting, red, orange, gray. May 31, 2016 by Travis Friedrich. For the New Jersey grooming gurus at Virile, we printed these thick two-sided cards on 600g pearl white Lettra with tinted white and black inks. We finished them with a rich brick edge paint. To help the impression pop, we like to use white ink tinted with a little bit of silver rather than print a completely inkless blind impression. Posted in business cards and tagged with pearl white, 600g, white, black, edge painting, red, brick, blind deboss, tinted white. January 26, 2016 by Travis Friedrich. Washington's Force Majeure Vineyard makes lovely Bordeaux and Rhone-inspired wines. We've been lucky enough to sample from their limited production and we think their wines pair beautifully with our custom letterpress stationery. We printed business cards, folded notes, and envelopes for Carrie and Todd using espresso and silver-tinted opaque white ink on Ecru Lettra paper. Posted in business stationery, business cards and tagged with business cards, espresso, tinted white, blind, ecru, 300g, notes. July 14, 2015 by Travis Friedrich. Ah, the blind-pressed monogram. 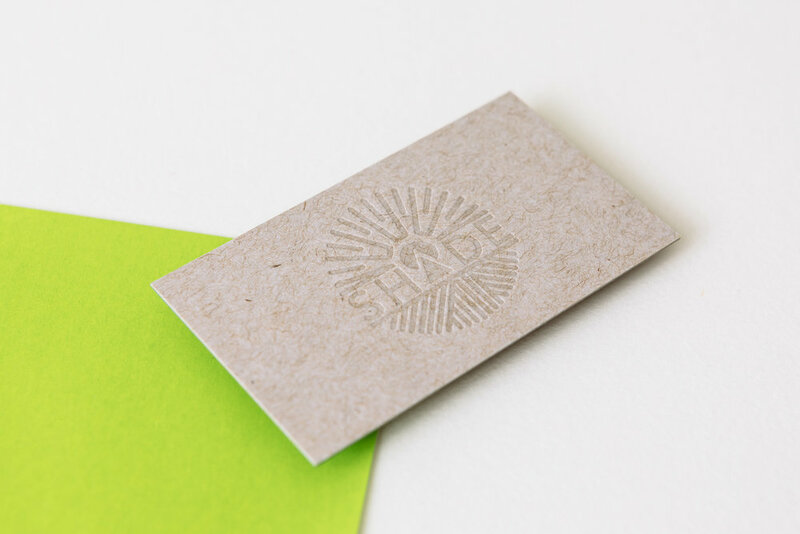 Hard to go wrong when you use a lightly tinted white ink with a deep impression on thick cotton paper. We carried the variations of the monogram through to each piece — an accommodations card with a tear-off reply card, a menu, table numbers with a blind chevron pattern and inkjet numbers, and programs with silver ink on navy cotton paper. Most letterpress inks are transparent, so we can't print light ink on dark paper. But silver is an exception — it's about 75% opaque. Not quite as opaque as foil, but not as pricey either. Posted in wedding invitations and tagged with midnight, tinted white, 600g, fluorescent white, monogram, programs, silver, 300g, blind, gmund, navy, chevron. April 14, 2015 by Sarah Arneson.